Bioengineering researchers from Rice University have developed OpenSLS, an open-source, selective laser sintering (SLS) platform. OpenSLS, a modification of a commercial grade CO2 laser cutter, is at least 40 times cheaper than its commercial counterparts, and can be used to print 3-D objects using different powdered materials—including plastics and biomaterials. The details and design specs can be found in an open-access paper published in PLOS ONE. Using a combination of relatively inexpensive, over-the-shelf components (including open-source microcontrollers), the researchers were able to bring the cost of the OpenSLS down to less than $10,000, a figure significantly cheaper than commercial SLS platforms, which can range from $400,000 up to $1 million. The team was able to demonstrate that the machine could print a series of complex objects from both nylon powder—a common material in high-resolution 3-D sintering—and from polycaprolactone, a polymer commonly used as a substrate for studies on engineered bone. OpenSLS differs from traditional 3-D printers by utilizing a different printing method. Most 3-D printers are “extrusion-based,” meaning they create objects by squeezing melted plastic through a needle in the shape of two-dimensional patterns. These layers slowly build up to form a three-dimensional object. OpenSLS instead uses the SLS laser to shine down onto a bed of plastic powder, melting or sintering at the laser’s focal point to form a volume of solid material. A single layer is formed by tracing a two-dimensional slice of the object. Powder is then laid down on top of this layer and the process is repeated. Successive layers then form the final object. “You can actually cut most of the required parts with the same laser cutter you are in the process of upgrading,” Miller said. The machine would then cost around $2000 and upgrading an existing cutter would only take a couple of days. While the printer demonstrates proof of concept, further research will be needed to see if the printer would be useful for bioengineering. 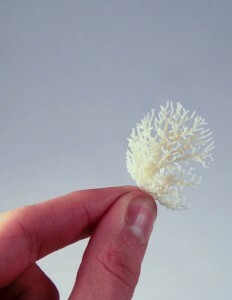 As it stands, OpenSLS is capable of fabricating wonderfully intricate objects, and it is precisely this sort of 3-D printer that is needed to replicate the immense complexities of biological structures. And the future possibilities are practically endless.